The phrase “Fake News” has exploded in usage since the election, but the term is similar to other malleable political labels such as “terrorism” and “hate speech”; because the phrase lacks any clear definition, it is essentially useless except as an instrument of propaganda and censorship. The most important fact to realize about this new term: Those who most loudly denounce Fake News are typically those most aggressively disseminating it. One of the most egregious examples was the recent Washington Post article hyping a new anonymous group and its disgusting blacklist of supposedly pro-Russia news outlets — a shameful article mindlessly spread by countless journalists who love to decry Fake News, despite the Post article itself being centrally based on Fake News. (The Post this week finally added a lame editor’s note acknowledging these critiques; the Post editors absurdly claimed that they did not mean to “vouch for the validity” of the blacklist even though the article’s key claims were based on doing exactly that). Now we have an even more compelling example. Back in October, when WikiLeaks was releasing emails from the John Podesta archive, Clinton campaign officials and their media spokespeople adopted a strategy of outright lying to the public, claiming — with no basis whatsoever — that the emails were doctored or fabricated and thus should be ignored. That lie — and that is what it was: a claim made with knowledge of its falsity or reckless disregard for its truth — was most aggressively amplified by MSNBC personalities such as Joy Ann Reid and Malcolm Nance, The Atlantic’s David Frum, and Newsweek’s Kurt Eichenwald. That the emails in the Wikileaks archive were doctored or faked — and thus should be disregarded — was classic Fake News, spread not by Macedonian teenagers or Kremlin operatives but by established news outlets such as MSNBC, The Atlantic, and Newsweek. And, by design, this Fake News spread like wildfire all over the internet, hungrily clicked and shared by tens of thousands of people eager to believe it was true. As a result of this deliberate disinformation campaign, anyone reporting on the contents of the emails was instantly met with claims that the documents in the archive had been proven fake. The most damaging such claim came from MSNBC’s intelligence analyst Malcolm Nance. As I documented on October 11, he tweeted what he — for some bizarre reason — labeled an “Official Warning.” It decreed: “#PodestaEmails are already proving to be riddled with obvious forgeries & #blackpropaganda not even professionally done.” That tweet was re-tweeted by more than 4,000 people. 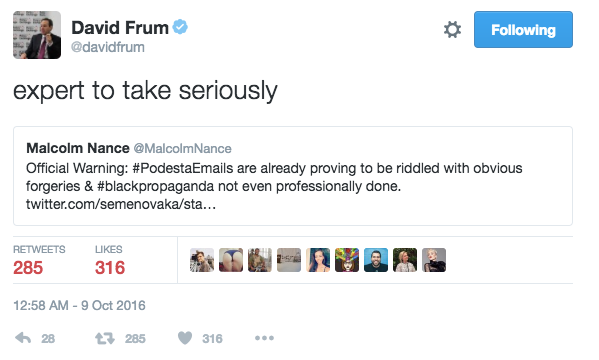 It was vested with added credibility by Clinton-supporting journalists like Reid and Frum (“expert to take seriously”). 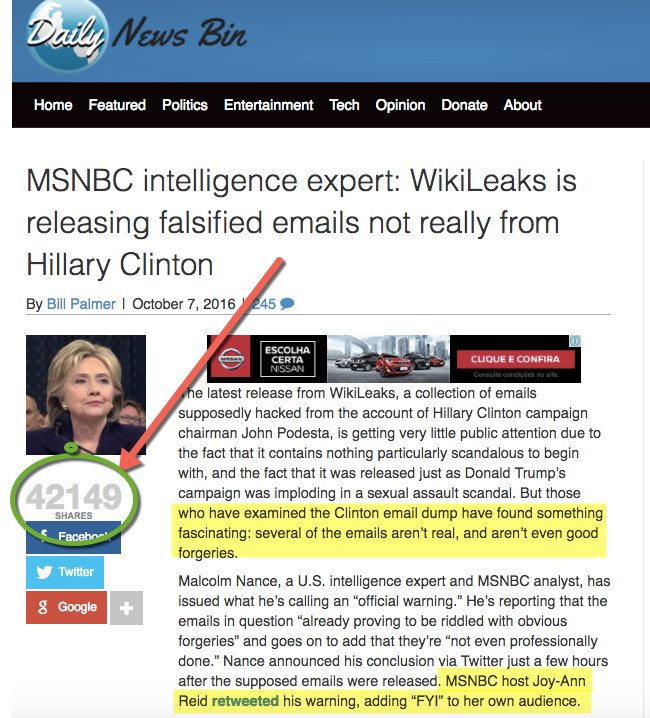 All of that, in turn, led to an article in something called the “Daily News Bin” with the headline: “MSNBC intelligence expert: WikiLeaks is releasing falsified emails not really from Hillary Clinton.” This classic fake news product — citing Nance and Reid among others — was shared more than 40,000 times on Facebook alone. 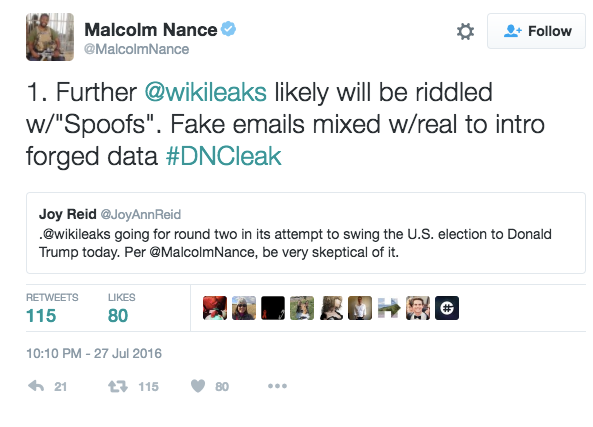 The media (@ABC, @CBSNews, @NBCNews and @PBS) must heed Malcolm Nance: “You should have ZERO CONFIDENCE in the contents” of Wikileaks dumps! From the start, it was obvious that it was this accusation from Clinton supporters — not the WikiLeaks documents — that was a complete fraud, perpetrated on the public as deliberate disinformation. With regard to the claim about the Podesta emails, now we know exactly who created it in the first instance: a hard-core Clinton fanatic. When Nance — MSNBC’s “intelligence analyst” — issued his “Official Warning,” he linked to a tweet that warned: “Please be skeptical of alleged #PodestaEmails. Trumpists are dirtying docs.” That tweet, in turn, linked to a tweet from an anonymous account calling itself “The Omnivore,” which had posted an obviously fake transcript purporting to be a Hillary Clinton speech to Goldman Sachs. Even though that fake document was never published by WikiLeaks, that was the entire basis for the MSNBC-inspired claim that some of the WikiLeaks documents were doctored. But the person who created that forged Goldman Sachs transcript was not a “Trumpist” at all; he was a devoted supporter of Hillary Clinton. In the Daily Beast, the person behind the anonymous “The Omnivore” account unmasks himself as “Marco Chacon,” a self-professed creator of “viral fake news” whose targets were Sanders and Trump supporters (he specialized in blatantly fake anti-Clinton frauds with the goal of tricking her opponents into citing them, so that they would be discredited). When he wasn’t posting fabricated news accounts designed to make Clinton’s opponents look bad, his account looked like any other standard pro-Clinton account: numerous negative items about Sanders and then Trump, with links to many Clinton-defending articles. In his Daily Beast article, published on November 21, Chacon describes how he manufactured the forged Goldman Sachs speech transcript. He says he did it prior to learning that the WikiLeaks releases of Podesta emails contained actual Clinton speech excerpts to Wall Street banks. But once he realized WikiLeaks had published actual Clinton transcripts, Chacon began trying to lure people he disliked — Clinton critics — into believing that his forged speeches were real, so that he could prove they were gullible and dumb. At the end of the day, did this change anything? I don’t know. I think I inadvertently hurt WikiLeaks, which I’m not proud of — but I’m not too sorry about either. I suspect that some people came to realize that they were believing in fake things. That last sentence — that as a result of his fraud, “some people came to realize that they were believing in fake things” — is false, at least insofar as it applies to people like Eichenwald, Frum, Nance, and Reid. Even though it was clear from the start to any rational and honest person that there was zero evidence that any of the WikiLeaks documents were doctored, and even though (as Chacon himself says) nobody minimally informed (let alone supposed “intelligence experts”) should have been fooled by his blatant Fake News, none of the journalists who lied to the public about these WikiLeaks documents have even once acknowledged what they did. Their Fake News tweets — warning people to view the WikiLeaks documents as fake — remain posted, with no subsequent retraction or acknowledgment of the falsehoods that they spread about the WikiLeaks archive. That includes MSNBC segments that spread this accusation. I will be shocked if any of them now acknowledge this even with Chacon’s confession. 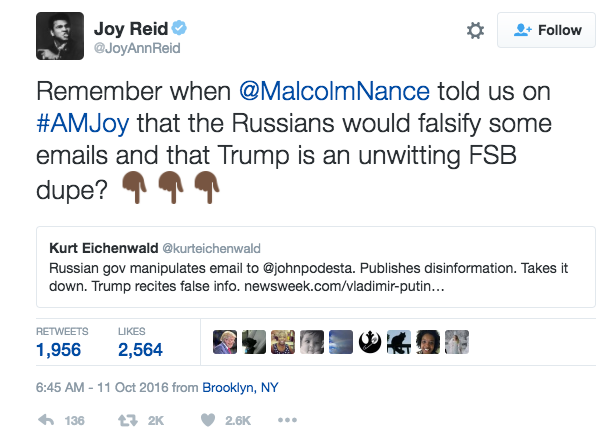 That’s because MSNBC has repeatedly proven that it tolerates Fake News and outright lies from its personalities as long as those lies are in service of the right candidate (when Democrats were smearing Jill Stein as a Kremlin stooge, Reid’s program aired Nance’s lie to MSNBC viewers that Stein had previously hosted her own show on RT: an utter fabrication that MSNBC, to this day, has never corrected or even acknowledged despite multiple requests from FAIR). Every day, literally, you can turn on MSNBC and hear various people so righteously lamenting the spread of “Fake News.” Yet MSNBC itself not only spreads Fake News but refuses to correct it when it is exposed. How do they have any credibility to denounce Fake News? They do not. Exactly: If you have prominent journalists telling the public to trust an anonymous group with a false McCarthyite blacklist, or telling it to ignore informative documents on the grounds that they are fake when there is zero reason to believe that they are fake, that is a direct threat to democracy. In the case of the Podesta emails, these lies were perpetrated by the very factions that have taken to most loudly victimizing themselves over the spread of Fake News. In the latest example why the “mainstream media” is facing a historic crisis of confidence among its readership, facing unprecedented blowback following Craig Timberg November 24 Washington Post story “Russian propaganda effort helped spread ‘fake news’ during election, experts say“, on Wednesday a lengthy editor’s note appeared on top of the original article in which the editor not only distances the WaPo from the “experts” quoted in the original article whose “work” served as the basis for the entire article (and which became the most read WaPo story the day it was published) but also admits the Post could not “vouch for the validity of PropOrNot’s finding regarding any individual media outlet”, in effect admitting the entire story may have been, drumroll “fake news” and conceding the Bezos-owned publication may have engaged in defamation by smearing numerous websites – Zero Hedge included – with patently false and unsubstantiated allegations. Now, at least, the “national newspaper” has taken some responsibility, however the key question remains: by admitting it never vetted its primary source, whose biased and conflicted “work” smeared hundreds of websites, just how is the Washington Post any different from the “fake news” it has been deriding on a daily basis ever since its endorsed presidential candidate lost the elections? The group’s list of Russian disinformation outlets includes WikiLeaks and the Drudge Report, as well as Clinton-critical left-wing websites such as Truthout, Black Agenda Report, Truthdig, and Naked Capitalism, as well as libertarian venues such as Antiwar.com and the Ron Paul Institute. This Post report was one of the most widely circulated political news articles on social media over the last 48 hours, with dozens, perhaps hundreds, of U.S. journalists and pundits with large platforms hailing it as an earth-shattering exposé. It was the most-read piece on the entire Post website on Friday after it was published. Yet the article is rife with obviously reckless and unproven allegations, and fundamentally shaped by shoddy, slothful journalistic tactics. It was not surprising to learn that, as BuzzFeed’s Sheera Frenkel noted, “a lot of reporters passed on this story.” Its huge flaws are self-evident. But the Post gleefully ran with it and then promoted it aggressively, led by its Executive Editor Marty Baron. In his article, the Post’s Timberg did not include a link to PropOrNot’s website. If readers had the opportunity to visit the site, it would have become instantly apparent that this group of ostensible experts far more resembles amateur peddlers of primitive, shallow propagandistic clichés than serious, substantive analysis and expertise; that it has a blatant, demonstrable bias in promoting NATO’s narrative about the world; and that it is engaging in extremely dubious McCarthyite tactics about a wide range of critics and dissenters.